Handbags for women made in blue tarpaulin and with the Spanish flag and leather overlays. This handbag has a very bull-fighting design and a very beautiful detail of a stirrup. Made in Spain. Dimensions: 35cm wide x 23 cm tall x 12 cm deep. Original backpack with the Spanish flag. Made in blue tarpaulin and with leather overlays. Its claps is in shape of a stirrup. Made in Spain. It is practical and elegant. Dimensions: 23cm wide x 31cm tall x 14cm deep. Find out the collection of handbags with the Spanish flag that we have. The handbag model cesta divisa is made in blue tarpaulin and leather overlays with the detail of a beautiful stirrup. Made in Spain. Dimensions: 33cm wide X 23cm tall X 12cm deep. Find out the wide catalogue of handbags with the Spanish flag that we have, you will want to buy all of them. The handbag model Asa is made in blue tarpaulin and leather overlays with the beautiful detail of a stirrup. Made in Spain. Dimensions: 26cm wide X 18cm tall X 10cm deep. Small shoulder bag made in blue tarpaulin and with leather overlays. The Spanish flag crosses it from top to bottom and it has a beautiful detail of a stirrup. Made in Spain. Dimensions: 25cm wide X 20cm tall X 6cm deep. This purse made in blue tarpaulin with the Spanish flag and a detail of a stirrup, is fastened with a magnet that it has under its flap. It can be used as a purse, combining it with some of our bigger handbags. Dimensions: 26cm X 12cm X 2cm. We introduce you this purse made in blue tarpaulin, with the Spanish flag and the detail of a stirrup. This purse is unisex, both men and women can take it. Dimensions: 28cm X17cm X4cm. Purse with a very bullfighting style in navy blue. It is fastened with a zip and you carry it with a handle in your wrist. It has a very bullfighting design because it has the badge with the Spanish flag and a leather strap with cattle symbols. It is a unisex model, it can be a purse for both men and women. Dimensions: 27cm X 17cm X 2cm. Attractive beach or city bags collection, perfect for an informal attire. This material bag is an ideal complement when you go shopping, to the beach or as a present. The printing is typical Spanish. 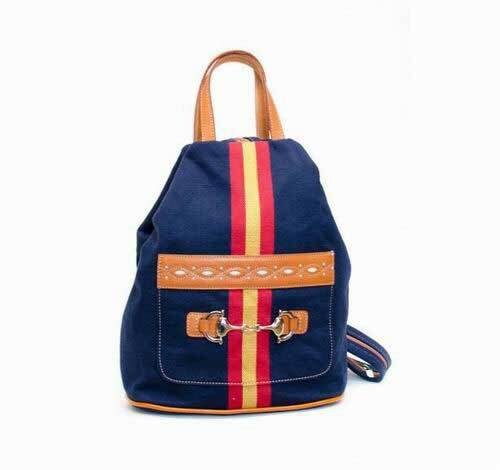 Bag 100% canvas with zip. Measurements: 38 x 30 centimeters / 14.96 x 11.81 inches.